How do you solve a problem like footbathing? Members of the technical team at Provita are fully aware of the fact that footbathing can often be a tedious job. In addition, it is very difficult to ensure that the dilution rate is correct in every footbath. Studies have shown that 93% of footbaths are used incorrectly. Also the handling of chemicals can be dangerous. Provita are currently offering a bespoke semi-automated system which can help solve the problems which come with footbathing. The system can be tailored to the farm’s specific requirements and each of the elements below can be customised to suit your farm. There is an option for a modified water powered pump which will apply the Hoofsure Endurance to the footbath through an in-line water supply. This means that you will not have to handle any chemicals making it safer to use. Hoofsure Endurance will always be used at the correct dilution, and the pump can be easy adjusted to release a percentage of the product between the dilution rates of 1% to 5%. Another option is an electronic control box which can pump a set amount of water to the footbath at the press of a button to ensure the correct depth. The final part of the system is the footbath itself which can be plastic or made to measure concrete or 3.5mm stainless-steel which can have the emptying bung or nut positioned differently as required. Adrian Daly, from Eglish in Co Tyrone, runs a 90-cow dairy herd with plans to expand to 130 cows in the next year. He explains why he contacted Provita to help with lameness on his farm. “I called Provita back in the spring time, around the end of April. I recognised that we had a big problem and needed help to sort out the levels of lameness on the farm. We had used other products to tackle the problem however nothing seemed to work properly,” he said. “Within the first month, the results showed that lameness had halved. Since then lameness due to Digital Dermatitis has become non-existent. “Like most farmers, Adrian is very busy and time is at a premium and he admitted footbathing was too time consuming at busy times of the year. Therefore we agreed to help upgrade the footbath system. “In order to ensure that the footbathing process was as simple as possible, we added a control box which means that filling the footbath is as simple as pressing an on button. The dilution pump which was installed keeps the solution rate at the level selected. 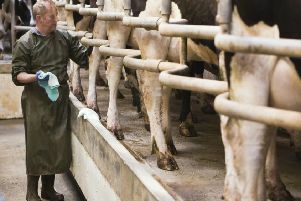 The footbath solution is then pumped through a pipe from the dairy to the footbath on order to keep the control box and pump away from and the cows. “To ensure correct depth there is also top up button, this will allow Adrian to maintain the adequate depth of solution needed when using the footbath fill for a second, third or even fourth fill. “Overall this way of footbathing is very convenient for me. I can be sure that the footbath is filled with the exact concentration and depth. I don’t need to worry about handling the product or that I might waste any. It has made the whole process very simple and I can see the great results from using a semi-automated system with Hoofsure Endurance,” Adrian commented.